Foreign ministers of Non-Aligned Movement nations plan to back Iran’s nuclear programme, according to the draft of a statement to be adopted at a NAM ministerial meeting beginning here tomorrow. 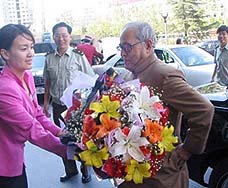 Defence Minister Pranab Mukherjee today said he hoped to have a "very useful" meeting with the Chinese leadership to further consolidate India's strategic relationship with the Communist giant. S ir Edmund Hillary has condemned attitudes to climbing Mount Everest as “horrifying” as climbers “don’t give a damn for anybody else who may be in distress”. Indian film production companies were a hit at the Cannes, with a majority of the participants inking new deals at the world’s largest film festival. A star is born. Hollywood heavyweights Angelina Jolie and Brad Pitt — described as the ‘’world’s most beautiful family’’ by ‘People’ — have had a baby daughter in one of the most anticipated celebrity stories of the year, the magazine today said. The ministers assert all nations have the right to research, produce and use nuclear energy for peaceful purposes, a copy of the draft obtained by Kyodo News said. The draft calls for a “balanced and even-handed” approach toward the Iranian nuclear issue and denounces threats to attack “peaceful” nuclear facilities. It is expected to defend NAM member Iran’s nuclear programme, saying the activities are under the eye of the International Atomic Energy Agency. “Any rightful nuclear activity for peaceful purposes under the agency’s safeguards does not constitute any concern,” the draft says. The issue should be resolved within the IAEA framework and countries should not pressure the IAEA or interfere in its work, it says, urging Iran to cooperate with the agency. However, there is disagreement among NAM members over the proposed statement, which officials said was mainly prepared by Malaysia, Iran and Indonesia. Some members are also calling for a more “realistic” approach to the problem. Iran officials said they expected the 114-member NAM to support its uranium enrichment programme. "I am expecting a very useful meeting with the leadership of China in the context of our growing relations and strategic partnership for peace and stability," he told PTI on arrival here from Japan on the second leg of his three-nation tour. "I do hope that this visit will also help to achieve that objective," Mr Mukherjee, who was warmly welcomed at the Beijing International Airport by the Indian Ambassador to China, Mr Nalin Surie, and senior officials from the Chinese People's Liberation Army (PLA), said. Mr Mukherjee's visit is a major highlight of the joint activities undertaken by the Indian and Chinese Governments to mark 2006 as the 'Year of India-China Friendship'. The Defence Minister, who is here on a six-day visit as a guest of his Chinese counterpart, General Cao Gangchuan, will hold official-level talks tomorrow. Besides holding official talks with Gen Cao, he will also meet with the Vice-Chairman of the Central Military Commission, General Guo Boxiong, and the Chinese Foreign Minister, Mr Li Zhaoxing. Sir Edmund Hillary has condemned attitudes to climbing Mount Everest as “horrifying” as climbers “don’t give a damn for anybody else who may be in distress”. The first man to the summit of Everest, in May 1953, said people have a “duty” to try to help people they find on the mountain in distress. His comments come days after the first double amputee to climb Everest defended his decision not to help a British climber who lay dying on the mountain. New Zealander Mark Inglis, aged 47, revealed that his party saw a stricken David Sharp as they climbed the 29,028ft peak. He said Mr Sharp, 34, from Guisborough in Cleveland, was suffering from oxygen deprivation when he passed him sheltering under a rock. His body remains on the mountain. “Trouble is, at 8,500m it’s extremely difficult to keep yourself alive, let alone keep anyone else alive,” Mr Inglis said. Sir Edmund, also a New Zealander, said: “On my expedition there was no way that you would have left a man under a rock to die.It simply would not have happened. It would have been a disaster from our point of view. There have been a number of occasions when people have been neglected and left to die and I don’t regard this as a correct philosophy. I am absolutely certain that if any member of our expedition all those years ago had been in that situation we would have made every effort,” he told the New Zealand Herald. Mr Sharp was on his way down from the world’s highest mountain when he got into difficulties. The engineer had climbed alone, after leaving the UK on March 27 to travel to Everest’s base camp. He was on his third climb of Everest when he apparently ran out of oxygen about 984 ft (200 m) below the summit as he made his descent. Climbers found his body in a cave last week, 1000 ft (305 m) below the summit. India has been projected as a shooting location, post- production and for special effects outsourcing. Indian film content has been widely accepted beyond the Indian diaspora and domestic market, a press note by industry body CII, which took a delegation to the festival, said. A representative for the couple said Jolie, 30, had given birth to Shiloh Nouvel Jolie-Pitt on Saturday in Namibia, a sparsely populated desert country in southwest Africa. Local residents in the Walvis Bay, shrouded in fog today morning, were thrilled by the celebrity birth.